For over 100 years, the Maytag name has stood for something that’s as important today as it ever was, dependability. In fact, Maytag never strayed from a focus on better-built equipment that delivers remarkable reliability, day after day. Maytag also never been more serious about making sure every part—whether it’s a door, drum or drive shaft—is up to the job. As the number one preferred brand in laundry,* it’s clear people recognize and value our ongoing devotion. Maytag’s roots go back more than a century with the Maytag appliance company, which gave the Maytag® Commercial Laundry brand its launch in 1956. Since then, Maytag has been behind many industry firsts—including the only five-year all-parts warranty on coin-operated equipment—while continually expanding our product portfolio. Maytag now offers a full range of user-friendly commercial washers and dryers for the coin, multi-housing, on-premises, and industrial markets. Recognizing the need to help save utility costs and natural resources, energy-efficient solutions are present throughout the lineup. What’s more, Maytag has positioned to stay ahead of the industry thanks to a state-of-the-art commercial laundry lab. Continuous testing helps Maytag raise the bar on powerful cleaning, efficient operation, and of course, the performance of every part inside Maytag’s famously dependable machines. 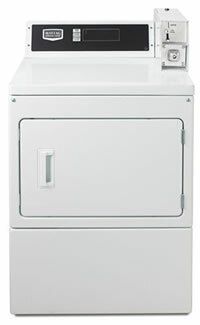 All Maytag commercial lines are available through Justin Laundry Systems.